Superbikes rule the hearts and the bedroom walls of many automotive enthusiasts. But not everyone can afford these expensive machines. 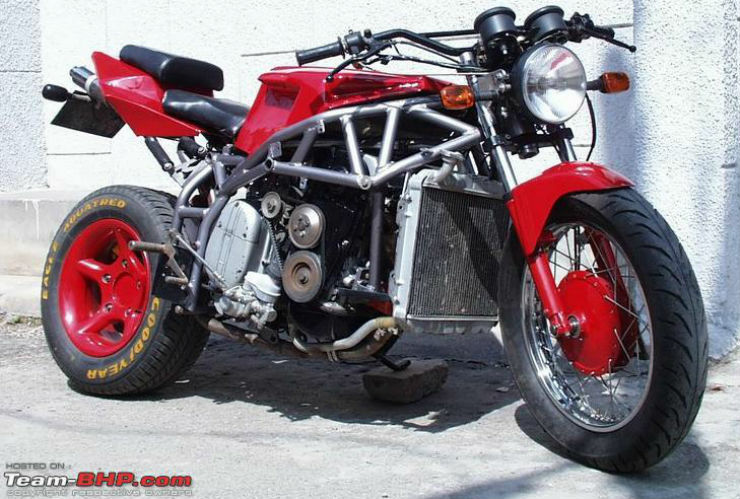 Then, there are enthusiasts who go one step further to make ‘home-made’ superbikes that are powered by car engines. And some take innovation to an all-new level and build hubless bikes. 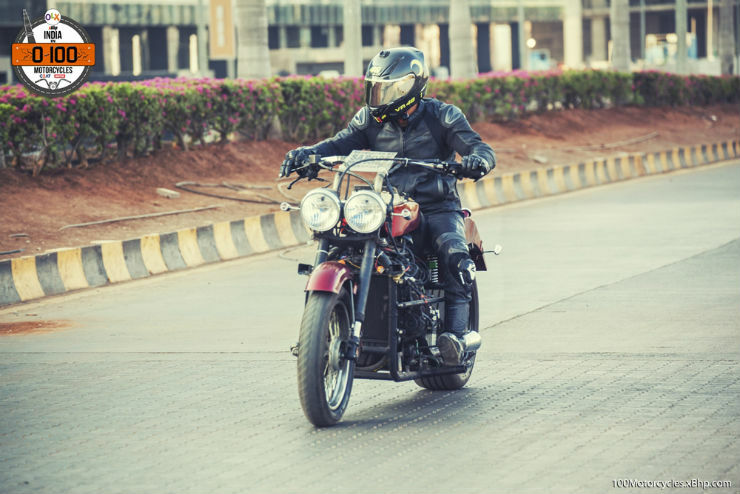 The motorcycle hails from Pune and has been built by Nilesh Sarode. 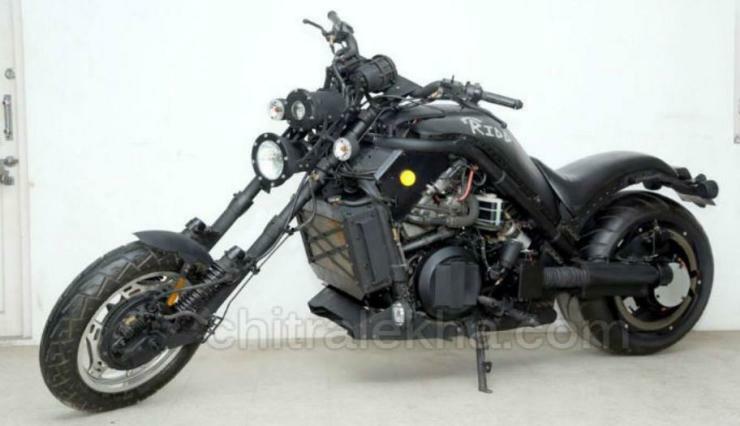 The motorcycle looks like a dragon-on-wheels and 99% percent parts of the machine are hand made. The front shock absorbers are from KTM Duke while the brakes are from Bajaj Pulsar. The Trailblazer uses a 3-cylinder engine from the Maruti 800. The chassis has been purposely built and the engine is mounted longitudinally. The final drive is a shaft, which makes sure that minimal power loss happens. The rear tyre is from a car, with a flat profile. The display console on the motorcycle has been taken directly from the Maruti 800 itself. The gearbox too is from the hatchback. The rear fender also serves as the fuel tank for the motorcycle. The unusual location is to avoid the heat generated from the engine. 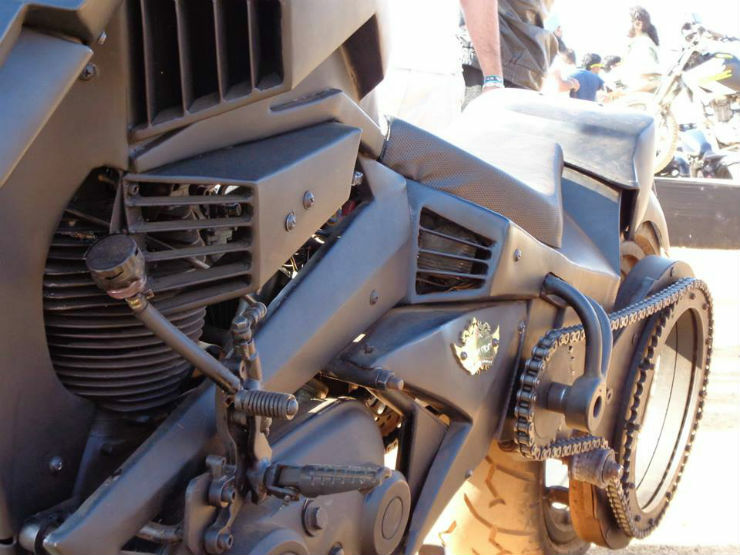 The motorcycle took around 5 months to take shape. The engine produces about 45 BHP and the motorcycle weighs 350 kg dry. 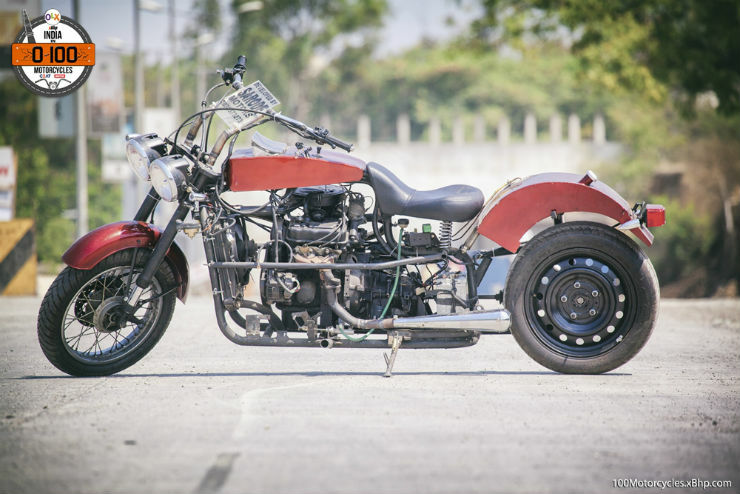 Ridd is a custom, car-engined superbike built by a youth from Rajkot, Gujarat. 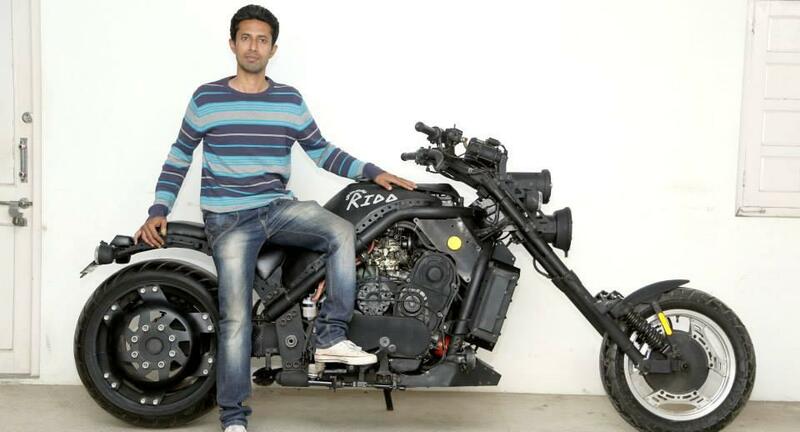 Riddhesh Vyas, creator of the motorcycle took 8 long years to put together this superbike. The chopper is powered by 1,000 cc engine of the Maruti 1000, and a lot of hand-made custom parts have been used. The front forks are raked out and the motorcycle measures 9 feet in length. The motorcycle weighs as much as 400 kg. The Ridd gets a hydraulic clutch, single-side swing arm and a swing arm integrated suspension. It can hit a top speed of about 170 km/h. The Ridd has also won the Limca Book of Awards for becoming India’s first hand-made superbike. 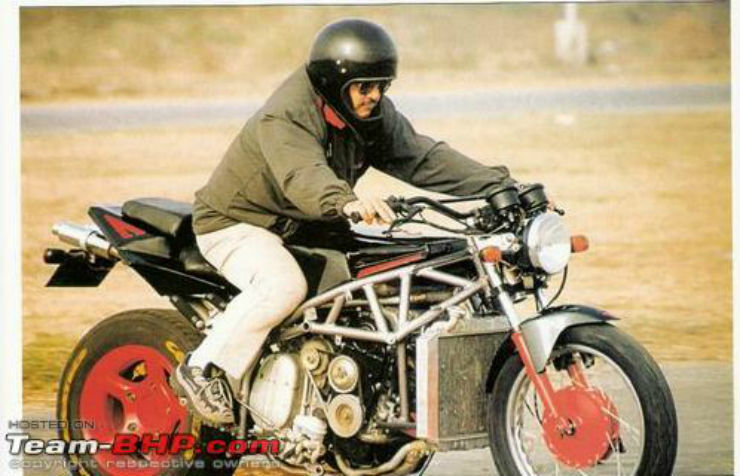 This was one of the first hand-made superbikes in India. The project was taken up by the Jeevanjit Singh from Chandigarh, Punjab. The inception of the superbike happened for a college project. 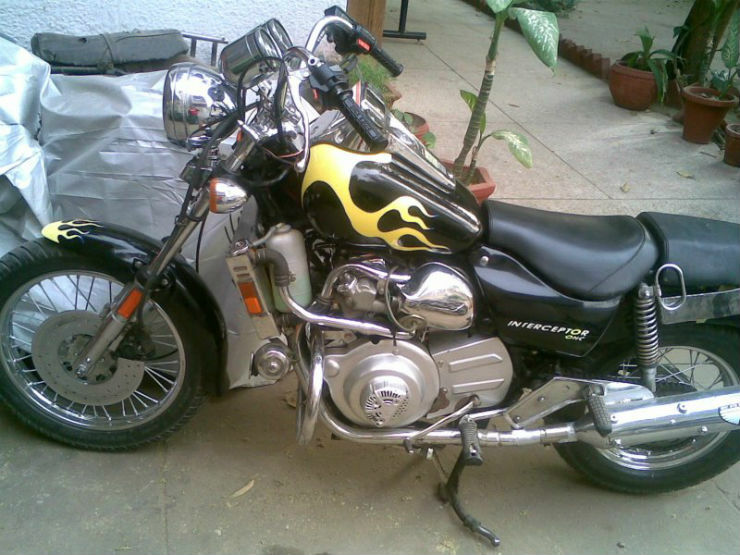 The motorcycle utilises the 1.3-litre MPFI engine of Maruti Gypsy. The gearbox is a heavily tweaked version of the RD 350. The frame of the motorcycle is inspired by the trellis frame of many modern motorcycles. The single-side swingarm of the superbike hosts a Tata Safari tyre. The motorcycle weighs 300 kg and can reach 160 km/h. The Steel Rhino is modification job done by a Dehradun-based custom house. The motorcycle uses a Yamaha RD 350 chassis. The fuel tank is hand made and has been shaped beautifully. The engine comes from Maruti 800 and the gearbox from the Yamaha RD 350. To handle the extra weight, the motorcycle gets quad front shock absorbers. It runs on 15-inch front and 17-inch rear tyres. The motorcycle has been tested to reach a top speed of 185 km/h. The mod job was completed in about Rs. 4 lakh. The Royal Enfield Interceptor was a quite popular motorcycle in its time. 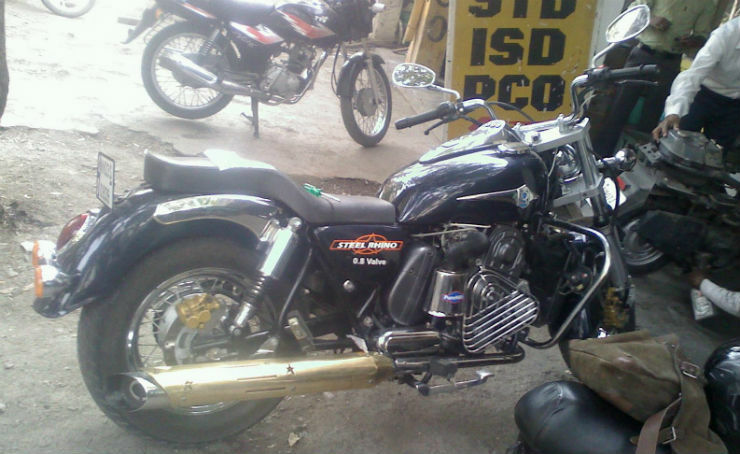 This modification job is inspired by the Interceptor but is powered by a Maruti 800 engine. The motorcycle has not been modified as such but the new engine in a shiny case is very much visible. The radiator is also tucked neatly in the place of the original engine. A bunch of enthusiasts from Jaipur, Rajasthan, conceived the idea of the cost-effective hubless tyre. The indigenous version looks great, and the total cost of modification is a fraction of the kits available in the international market. The group, known as ‘Freedom Spirits’, made the motorcycle a reality. Abhishek Sharma, Mohammad Ansar, Sarvesh Khemka, Yashodeep Yadav and Ankur Tiwari are the five youngsters associated with the project. 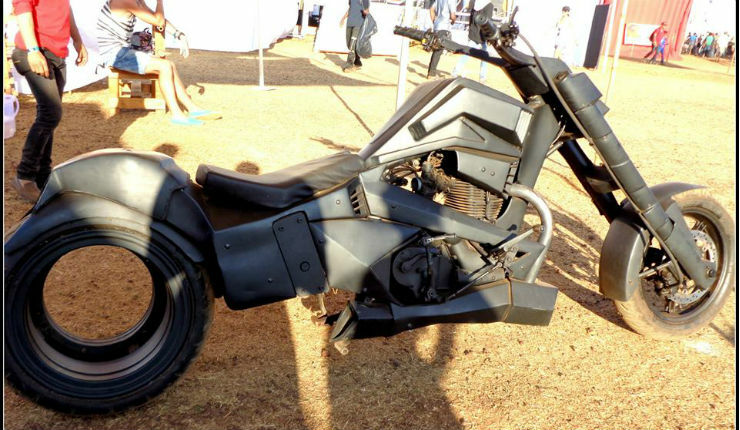 The motorcycle is called Gennext wheel, and the team put it together for a biker’s event – India Bike Week. The motorcycle was showcased in the 2014 edition of the India Bike Week held at Goa. How do hubless wheels work? Hubless wheels work by fixing the rotating parts (brake ring, bearings, hubless rim) onto the outer side of a non-rotating inner ring that attaches to the motorcycle’s swingarm or fork. Here’s a video that explains how these parts works. 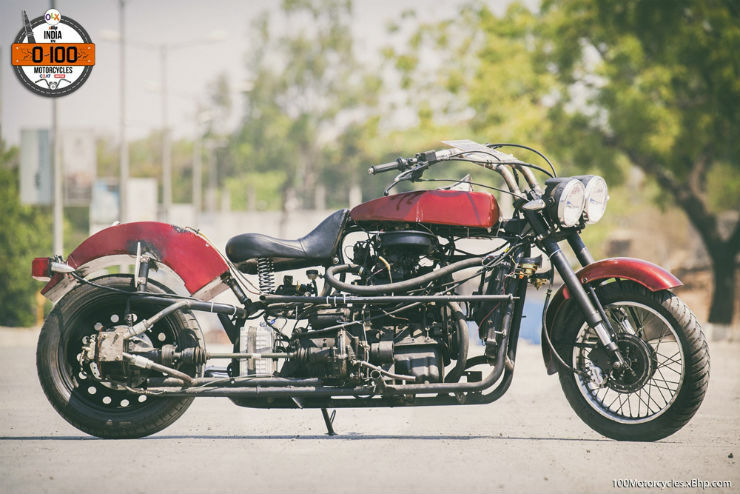 The modification is done on a Royal Enfield Lightning 535, but the final form of the motorcycle looks nothing like a Royal Enfield. There have been several modifications done to the bike. All the body panels have been changed. With the rear hubless kit, the motorcycle now measures over 9 feet in length. According to the modders, the hubless rear wheel considerably lowers the weight of the motorcycle, therefore, reducing the fuel consumption. The motorcycle was tested over longer routes before getting selected for the mega motorcycle event. Any more such bikes from India? Hubless motorcycles need extreme precision to work properly. 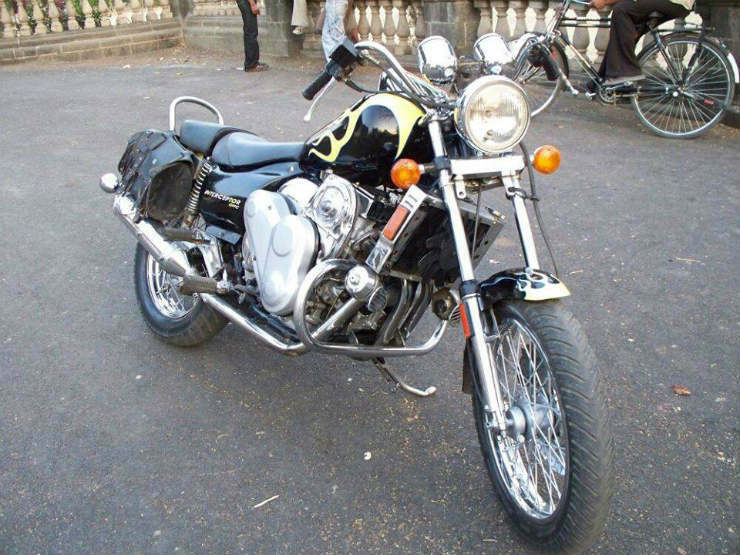 There are two more motorcycles from India that have been converted into hubless bikes. 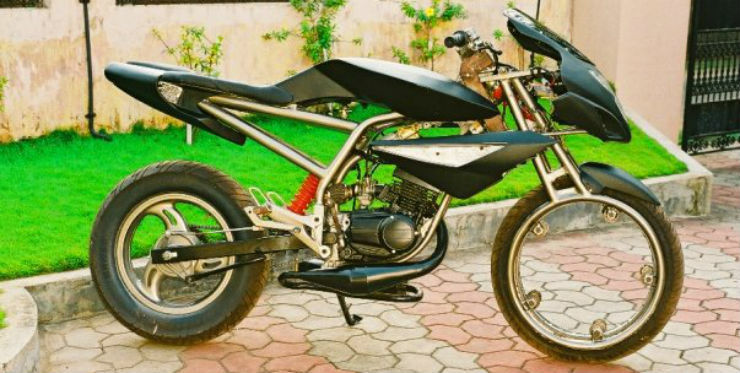 The Bajaj Pulsar here has been modified to get a front hubless wheel. The one-off project also gives the motorcycle a minimalistic look with exposed chassis. The engine on this motorcycle looks like a 2-stroke engine, replete with the expansion chamber exhaust system. 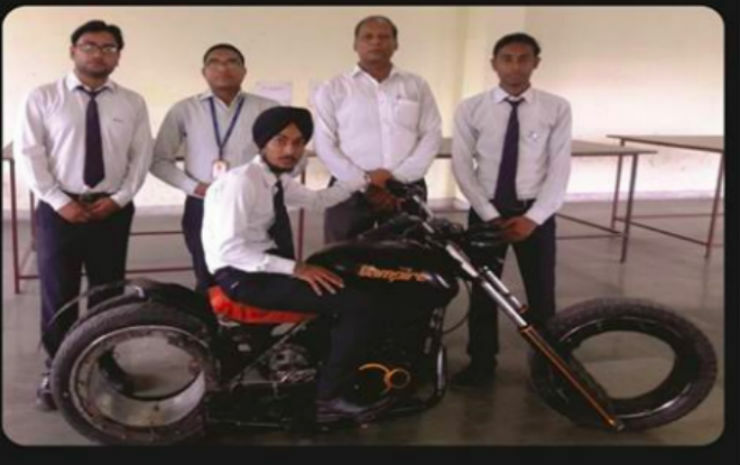 Mechanical engineers from a college in Ujjain have developed a hubless Cruiser bike. The unique thing about the motorcycle is that it features hubless wheels, both at the front and the rear. The motorcycle was developed as a college project by the students. « Volvo emergency braking saves child from certain death: Must watch video!